Though it is quite pedantic to think of a banana tree as anything other than a tree, it is in fact an herb — an herb whose leaves can grow up to 4 yards long (3 1/2 metres.) The stalk of the plant generally grows up to 20 feet tall (6 metres.) A banana plant can produce multiple stalks, but generally farmers trim them back to 2 or 3 stalks (see Banana Shoots.) Each stalk will take about 18 months from first growth to flower. Once flowered, it can pollinate itself — it doesn’t rely on insects to cross-pollinate it. Each stalk will produce 1 bunch (aka “comb” or “hand”) of Bananas, then die. The corm part of the plant underground, though, remains alive, and other stalks can grow up from this. Banana plants are best grown under a canopy of other trees. They do need a lot of sun for the energy to produce the fruit, but if the fruit is exposed directly to full, hot sun, it may turn black before it ripens. Banana trees reproduce by seed or by sending out underground shoots (or “suckers”) off their corms. Cultivated banana trees, though, won’t produce seeds: they are sterile, in order to avoid fruit with hard seeds in them. To propagate them, farmers cut the shoots and plant them where they want the trees to grow. There are over 500 kinds of Bananas. Not all varieties of Bananas are white inside, even though that’s all we see at the supermarkets, usually the “Cavendish” cultivar. A variety called “Island Banana”, for instance, is pink inside, and it has a denser texture that what we are used to. 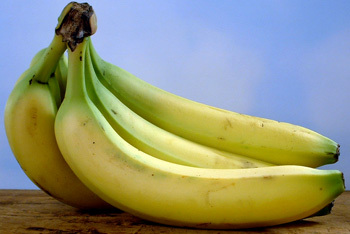 Banana skins can be green, yellow or red. Only half of the world’s Bananas are eaten ripened and sweet as a fruit; the other half are eaten when they are unripened and the starch has yet to convert to sugar. These unripened versions are used as a starchy vegetable as one would potatoes — or as one would use Plantain, to which Bananas are closely related. These are called “Plantain Bananas” or Platanos or, confusingly sometimes, just Plantains. They require cooking, usually roasting, baking, boiling or frying. They are also dried and ground into flour. Bananas suffer cell damage and the release of browning and other compounds when cold, which is why their skin turns black in the refrigerator. But this does not damage the fruit inside. When buying Bananas, avoid any that have split skins. 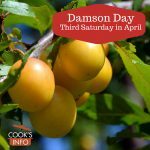 If you don’t want to eat them the same day, it’s okay to get those that still have a bit of green on the skin, as they will ripen at home over the next day or two on your kitchen table or counter. Bananas with black patches on them aren’t “bad”; they’re just overripe, and you would probably prefer them in a banana bread than you would to eat them out of hand. Bananas, like apples and avocados, will start turning brown the millisecond they are peeled. Dip pieces in an acidic juice such as lemon, orange or pineapple, or mash with some juice. To make a baby food, mash ripe Bananas with orange juice. The orange juice (better for infants than lemon juice) will stop the Bananas from turning brown. You could also mash in strawberries, peas, etc. Then freeze in small containers, and thaw completely before using. Use overripe Bananas for mashing into baked goods; use slightly underripe Bananas for cooking where you want the shape to come through, as they will hold their shape better if slightly underripe. Rich in carbohydrate. Good mix of sugars which the body absorbs at different rates, giving a long-lasting energy boost to the body. High content of Vitamins C, B6, B2, B1, and folate. Low in fat and sodium. High in potassium which can help keep blood pressure low. Useful for anyone on a low-fat, low-sodium, cholesterol free diet. It’s a myth, according to a United States Food and Drug Administration press release as far back as 26 May 1967, that you can get high from smoking banana peels. They trapped 3 weeks worth of smoke from banana peels in a machine, and analysed it, and found no hallucinogens. Bananas will ripen at room temperature. Once they are ripe, to stop them from going on to spoil right away, you can put them in the refrigerator if you don’t mind what will happen to the skins. The skins will turn brown below 13.3 C, because temperatures lower than that damage the membranes in it: the damage releases enzymes, which turn the skin brown. [3b] The flesh inside will stay white for up to three days; after that, it will start turning brown, too. You can freeze Bananas for use later in cooking. First mash or purée ripe Bananas with a little lemon juice or orange juice (use about 1 tsp per banana.) The citrus juice will help prevent the banana from turning brown which does no harm, but is unsightly. Freeze in small portions so that it is easier to retrieve and defrost what you need. Can be used in cakes, breads, for baby food, etc (for baby food, you may want to use orange juice rather than lemon). Or, you can freeze them whole. That’s right, right in their skins. Bundle them into a freezer baggy or package them in plastic wrap and tin foil, and freeze. Use them later for a baked good such as banana bread. The earliest archeological records of people eating wild bananas may be from a cave in Sri Lanka, dating back to 10,000 BC or 9,000 BC. The earliest archeological record of cultivation may be from the highlands of Papua New Guinea, dating back 5,000 BC to 4,500 BC. The earliest written reference to bananas mentions that Nearchus, a general of Alexander the Great, saw bananas and sugar cane in India in 327 BC. They were grown in the south of China from 200 AD as a rare, exotic fruit. Bananas arrived Africa around 500 AD carried by traders from India, and in the Middle East and North Africa by 700 AD carried by Muslim traders. From West Africa, the Porteguese brought bananas to the Canary Islands. They arrived in South and Central America in the 15th and 16th centuries. In 1870, a man named Lorenzo D. Baker was bringing his ship “Telegraph” back from Jamaica to Boston empty. He agreed to take back with him a shipment of bananas. They arrived in Boston in reasonable condition and sold well. Commercial importation into England started in 1878, coming first from Madeira and a few years later from the Canary Islands. In 1896, another businessman (named “Minor C. Keith”) ran imports for 3 years from Costa Rica, but so many of the bananas arrived in unsellable condition that he didn’t pursue the venture further. Only in 1901, did regular, large scale importation start, coming from Jamaica, made possibly by steamships of the Imperial Direct Line with refrigerated ships. People in Europe and North America had to be taught what to do with Bananas. The growing popularity of them in North America was the foundation for what became the United Fruit Company. Bananas, along with oranges, provided North Americans with a fruit that was available at their markets during the winter months. By 1910, the trade in bananas was 1 million tons. By 1930, 2.3 million tons. By 1990, 9 million tons. Until 1935, Jamaica was the world’s leading producer of bananas. The banana trade was impacted by WWII. The shipping fleet necessary for it had to be rebuilt in the 1950s. In 1968, United Brands was formed. In Western Europe, banana consumption was 700,000 tons in 1950, and 3,820,000 tons in 1990. In Tennessee, it has been against the law since 1911 to drop banana peels on the street. The jingle for the Chiquita Banana song was written in 1944 by a song-writing team led by a Robert Foreman. The original singer was not Carmen Miranda, as many might guess, but rather Patti Clayton. In fact, Carmen Miranda never recorded the song. In 1945, Elsa Miranda from Puerto Rico took over in 1945 from Patti Clayton, and it was she that appeared in the commercials and made guest appearances in movies. Carmen Miranda’s headresses, however, were the inspiration for the cartoon banana lady that Chiquita used in its advertising. The Chiquita Banana song was one of the most successful commercial songs of all time, and as often as the Chiquita company wrote it to keep up with the times, it was parodied just as much. At the peak of its airtime play, it was heard over 350 times a day across America. You can put them in a salad. You can put them in a pie – aye. Anyway you want to eat them it’s impossible to beat them. In October 2008, “phloem bundles” shot to the top of search queries in Google, when TV game show “Who Wants To Be A Millionaire” contestant Mike Zeigler got asked what they were for his $100,000 question. “Today, bananas are still distinguished from plantains based largely on consumption of raw versus cooked fruits, but we know that they are not necessarily two different species. All banana and plantain cultivars derive from two main species, (Musa acuminata Colla and Musa balbisiana Colla. )” Riger, Mark. “Chapter 5, Banana and Plantain” in “Introduction to fruit crops.” Binghamton, NY: Haworth Press. 2006. Page 75. Kole, Chittaranjan. Genome Mapping and Molecular Breeding in Plants, Vol. 4: Fruits and Nuts. New York: Springer, 2007. Page 284. [3a] Brian James Atwell, Paul E. Kriedemann, Colin G. N. Turnbull. Plants in action: adaptation in nature, performance in cultivation. Palgrave Macmillan Australia, 1999. Page 357. [3b] O’Hare, Mick. Food science and food myths: James Bond may have been onto something. London: Daily Telegraph. 5 October 2010. Koeppel, Dan. Can This Fruit Be Saved? New York: Popular Science Magazine. June 2005. California Rare Fruit Growers, Inc. Fruit Facts, Volume 1: Banana. Retrieved March 2007 from http://www.crfg.org/pubs/ff/banana.html. Leung, Wency. That’s bananas! The potential demise of the world’s most popular fruit . Toronto: The Globe and Mail. 9 August 2011.